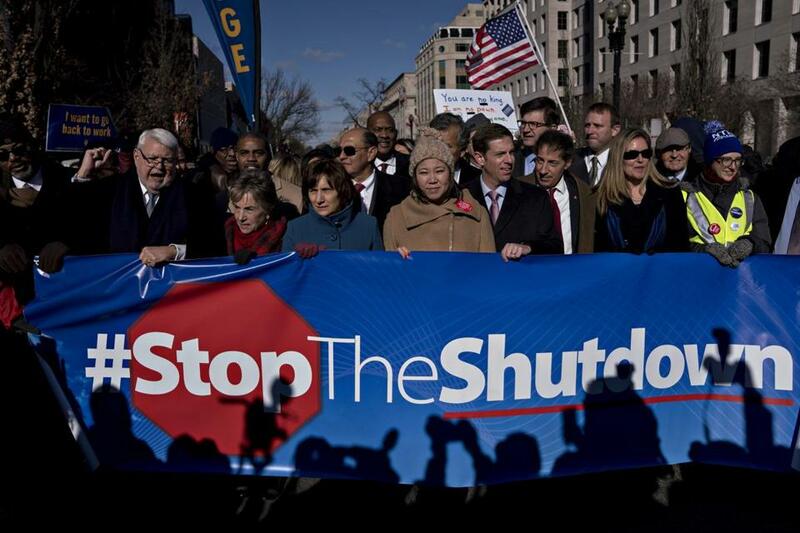 Demonstrators held a "#Stoptheshutdown" sign during a rally with union members and federal employees in Washington. Here’s what’s up with the partial government shutdown on Day 21. The shutdown matches the longest stoppage yet: a 21-day closure that ended Jan. 6, 1996, during President Bill Clinton’s administration. Financial pain hits some 800,000 federal workers who will not receive paychecks they were due on Friday. President Donald Trump holds a White House round-table on ‘‘border security and safe communities’’ with state, local and community leaders as he continues to highlight his rationale for insisting that a wall be built on the U.S.-Mexico border. Cities with economies tied to federal spending are showing signs of strain. One is Huntsville, Alabama , where about 70 federal agencies are located at the Army’s Redstone Arsenal: Hotel rooms are vacant because out-of-town government workers and contractors aren’t coming, restaurants frequented by federal workers are struggling, parking lots are empty and offices at NASA’s Marshall Space Flight Center are dark. Federal cleanups at Superfund sites around the nation have been suspended. The shutdown sets the all-time record on Saturday, Day 22, when it officially becomes the longest partial government shutdown in U.S. history. Trump’s administration is considering using billions of dollars in unspent disaster relief funds to pay for the border wall as Trump weighs signing a national emergency declaration to get it built without Congress. Nine of the 15 Cabinet-level departments have not been funded, including Agriculture , Homeland Security, State, Transportation, Interior and Justice. Some iconic National Park facilities are shuttered as are the Smithsonian museums and the National Zoo in Washington. Nearly everyone at NASA is being told to stay home, as are most at the Internal Revenue Service, which processes tax returns and issues refunds, though the administration says tax refunds will be issued during the shutdown.